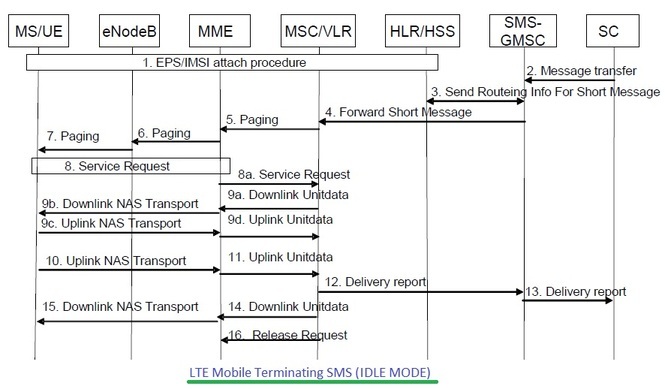 There are two main ways SMS can be delivered over LTE system. This is known as SMS over LTE. This can be delivered via Short Message Service Center referred as SMS-C.
• SMS Over SGs: Here LTE UE device sends and retrieves CS(Circuit Switched) based SMS messages. • SMS Over IP: Here LTE UE device sends and retrieves SIP PS(Packet Switched) based SMS messages. SMS over SGs transfer the messages between MSC and MME and transports the messages over LTE system using SGs interface. In this type the LTE UE does not fall back to legacy cellular systems such as GSM or CDMA. Existing roaming conditions will be reused in this type of SMS over LTE. In SMS over IP mode, SIP based SMSs are carried via IMS core element. In this type of SMS over LTE, SMS is to be transmitted is encapsulated in a SIP message in IP-SM-GW entity. This type need LTE UE having both IMS and SIP protocol stack as well as IP Short message gateway(IP-SM-GW), IMS core as well as HLR/HSS(home subscriber server) which supports SMS over IP with the help of home routing. 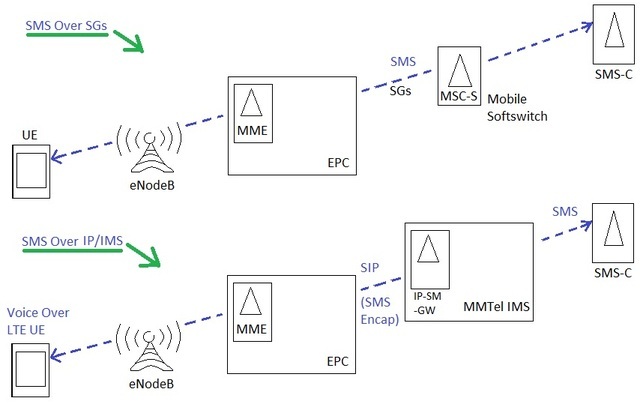 Figure depicts the entire LTE mobile originating SMS call flow. SC(service center) is responsible for relaying and forwarding of the SMS. SMS-IWMSC is interworking MSC for SMS system. HLR/HSS stands for home location register/home subscriber server. Let us understand LTE SMS MO Call procedure. 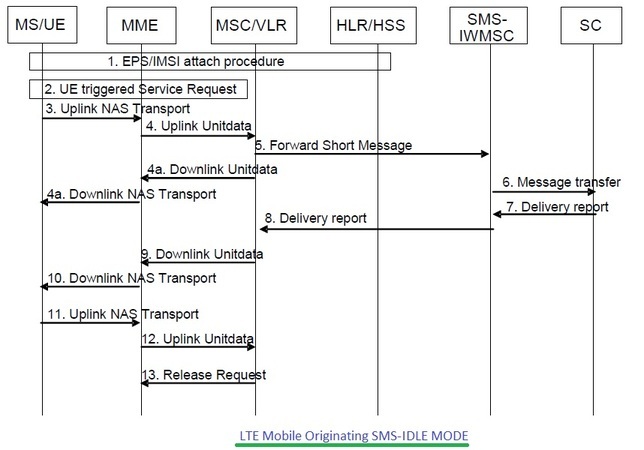 • After the EPS/IMSI attachment, LTE UE triggers service request in order to initiate mobile originating SMS. • SMS is encapsulated in NAS message and transmitted to MME entity. • MME forwards this SMS to MSC/VLR. • MSC/VLR acknowledges the receipt of SMS to LTE UE. • SMS is forwarded to service center(SC) which returns delivery report back to UE as shown in step-7 and step-8. • UE acknowledges receipt of dilvery report to MSC/VLR entity. • Release request is sent from MSC/VLR to MME. Figure depicts the entire LTE mobile terminating SMS call flow. The SMS retrived by LTE compliant UE from service center is referred as LTE SMS MT Call and SMS originated by UE is referred as SMS MO call. Let us understand SMS MT call procedure below. • Service center starts the transmission of SMS. • Based on routing information available with HLR SMS is forwarded to right MSC/VLR in the system. LTE UE is attached with this MSC/VLR. • MSC/VLR initiates paging message to MME. • The MME transmits paging message to each LTE eNodeBs on the tracking areas where in UE is registered. • After success in paging, UE transmits SERVICE REQUEST message to MME. • MME issues service request to MSC/VLR. • MSC/VLR packetize the SMS and forward the same to MME. • MME encapsulates SMS in NAS format and delivers to UE. • LTE UE acknowledges receipt of SMS to MSC/VLR entity. It also issues delivery report. This report is forwarded to service center. • MSC/VLR acknowledges receipt ofdelivery report to UE. It also informs MME about no NAS messages are left in the queue. • Finally MSC/VLR initiates release request to MME.